Two broken nails and a bad back could only be fixed with a manicure and a one-hour massage. So that’s what I had on Sunday, after one week at the Couture Sewing School! If you want to know, my dress is probably only 30% done but the learning experience and the amount of information acquired during one week with Susan Khalje is worth more than a finished dress. What is more, I met the most incredible crowd of couturières: from beginners like me to sewing stalwarts like Marina. We were such a multicultural and multilingual group coming from four corners of the world: the US, Canada, the Netherlands and me from Japan. Within our group, we spoke four foreign languages and shared our experiences both of sewing and life. We drank wine and ate not-very-healthy food from the hotel's restaurant, we sang, we danced, we went to bed after midnight and were back in the sewing room for 7am (some people even earlier)... All in all, I had an unforgettable week and plan to return to see Susan in March for the French Jacket class. I overestimated my capabilities for this project; it was not that easy as I thought. By Wednesday, I was still working on the muslin: after two fittings, I had to make muslin #3. The trickiest part with my dress was its construction. The designer replaced darts with side panels which shape the waistline. Once I’d tweaked one of the sides during the fitting, I needed to change at least two other sides in order to match all of the seams exactly. After the first fitting when Susan said there were not that many fitting issues, I was extremely happy because I wanted to start working with the fabric! But only on Wednesday night did I cut into the fashion fabric. The biggest area of progress for me was in working with silks and sewing corners. 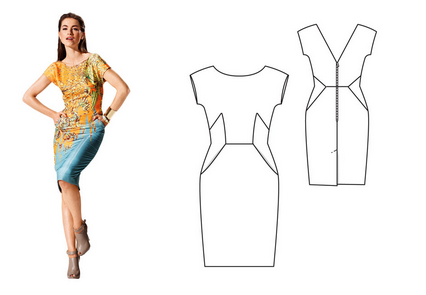 You can see from the design how many bl**dy corners shape the dress! I have to tell you that some of them I ripped and sewed in more than three times. Susan helped me to sew the main bust corners, but she also had a hard time with them. She was kind enough to reassure me that the corners on slippery fabric are tough even for the pros. I plan to write more detailed posts on the silks and corners and Couture Sewing School soon, but at the moment I have one more week ahead of me in New York city! Hope you understand! Wow!!!! Nunca había oido hablar de ello, pero suena muy interesante! Tienes que enseñarnos fotos del grupo de costura y de las clases. Te vas a hacer una costurera con mucho nivel! Very interesting! Will wait for next post about your class! I agree that home made pasta is cool and more tasty, but we don't have time to cook it every day%((( But for sewing this idea can work, I think! This sounds absolutely wonderful! I can't wait to read more about this and see some pictures of your epic corners! I wish you do that! Susan is an incredible teacher willing to share her knowledge! I can't wait to hear more about this course and your trip to New York. I love the idea of sewing like that..
Ooh, I'm so excited to hear more about your class! It sounds so cool! Sounds AWESOME!! I really want to do one of Susan's courses - long way from Aus though! Wow! Who doesn't wanna have Susan Khalje as a sewing instructor? Of course, I have lots of tips on fabric shopping in Tokyo (not in Japan though). When do you go? I don't know anything about KAI scissors therefore cannot comment on that. But I'll have a look when I am back next week.